Photographer courtesy Martin Margarrison. 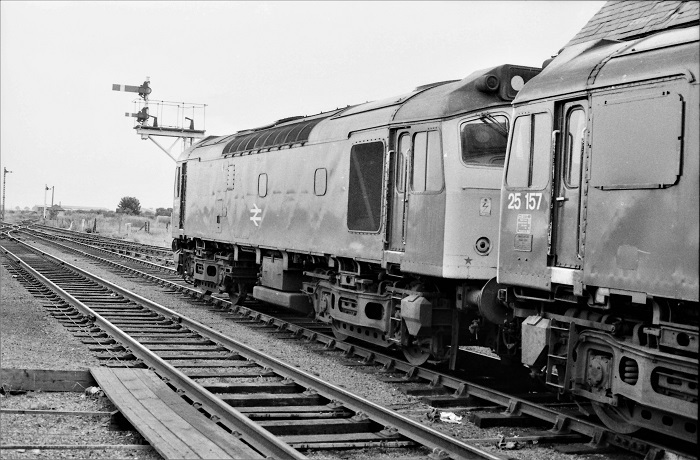 25131 & 25157 at Skegness on July 23rd 1979 waiting to return to Leicester. The eighteen year six month career of D5281/25131 saw allocations only to London Midland Region depots. Boiler room grills sheeted over. Time between withdrawal & scrapping: 54 months. July 1964 to Derby (16C). October 1964 to Cricklewood West (14B). January 1965 to London Division (Midland) (D14). April 1965 to Saltley (2E). April 1966 to Birmingham Divison (D02). April 1966 to London Midland (Midland) Lines. June 1968 to Nottingham Divison (D16). July 1968 to Liverpool Division (D08). November 1968 to Preston Division (D10). April 1972 to Nottingham Division (D16). July 1973 to Springs Branch. After withdrawal 25131 was stored at Toton from February 1983 to October 1983 when it was taken into Departmental stock on October 1st 1983 as 97202. Its new number was added about January 1984. Its Departmental service was brief, being reinstated on paper as 25131 to Toton to effect its disposal to Swindon Works. During the second week of July 25131 (97202), 25144*/25153* were dispatched Toton – Cricklewood* - Swindon July 10th-12th and later dumped at Cocklebury Yard on July 23th 1984, still numbered 97202. 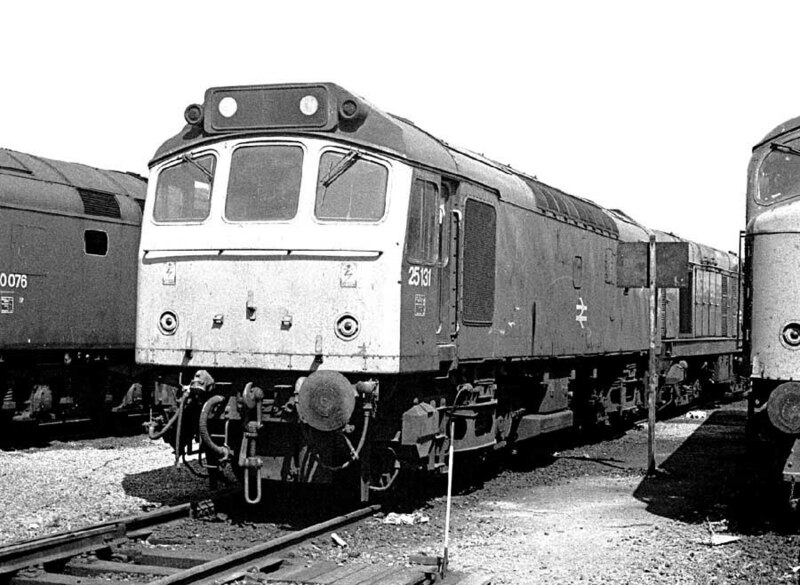 It was eventually sold to Vic Berry, Leicester for scrapping, moving to Cocklebury Yard on May 26th 1987, to Oxford Hinksey Yard on June 2nd 1987, them moving behind 20019 & 20197, reaching Berry's Leicester Yard on June 11th 1987. By the last week of June 1987 25131/97202 had been scrapped. Photographer unknown at this time. 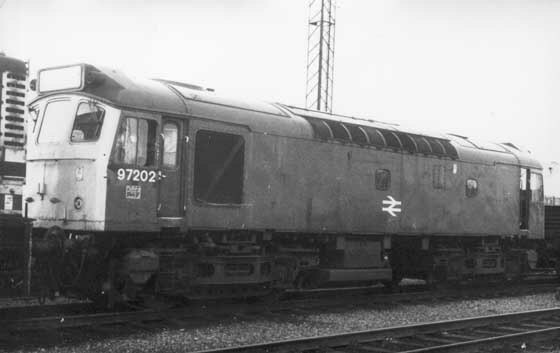 97202 out of service at Toton, date unknown. Noted Derby Works August 1964 (rectification?). Noted Derby Works May 1976. Noted Derby Works March 1978. The frames for D5281 were laid down at Derby Works during the spring of 1964, being delivered to Toton late in June 1964. D5281 made its test run to Corby on June 15th. D5281 was transferred to Saltley (2E) during April, spending a year in the Birmingham area. D5281 moved to the London Midland (Midland) Lines during April. The greater versatility of the diesels was illustrated in the use of Burton’s allocation which amongst other jobs handled the Burton - Banbury freights. In the first week of February D5281 was the training locomotive utilising six passenger coaches and a brake van as a load. 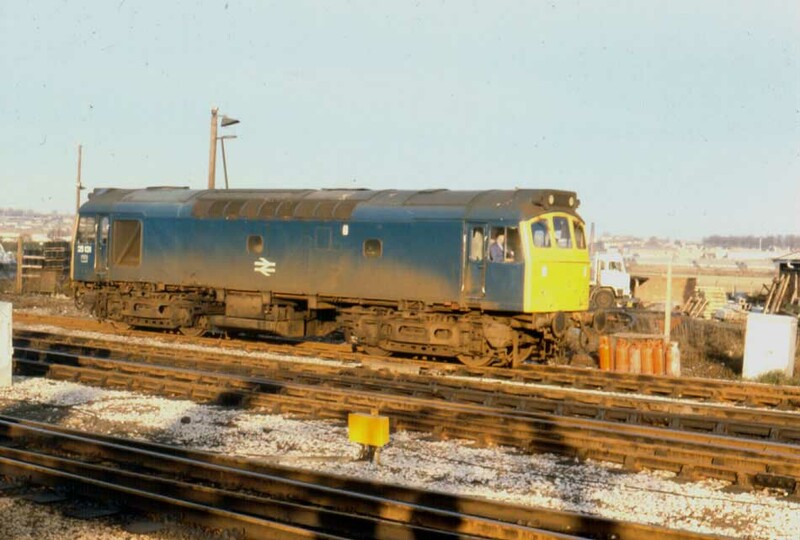 By mid-February the Banbury – Burton – Toton freights would converted to diesel haulage using Peaks or pairs of Class 25’s. These freights would also be used to incorporate the local workings from Nuneaton shed, allowing closure of that shed (on June 6th) and withdrawal of its few remaining steam engines. Freight on the Derby – Birmingham line was at this time evenly split between steam & diesel haulage. On July 19th the 20.22 Leeds - Holyhead was noted behind D5281 (presumed to have worked throughout). The next day (20th) D5281 & D5195 worked a Manchester - Filey Camp summer service. The Liverpool Division received D5280 - D5282 during July, whilst in November 5280 - 5283 were transferred to the Preston Division, 5281 remained here for the next three and a half years. The summer only passenger workings between Newcastle, Ayr & Stranraer continued to feature Sulzer 2’s. The 23.45FO Newcastle - Stranraer and the 13.50SO return working saw 5147 & 5281 in use on July 12th. This service had seen Class 40’s in 1968, though these had not ventured beyond Ayr due to lack of driver knowledge on the Stranraer line. Loads varied between nine & twelve coaches. 5280 - 5283 were transferred to the Nottingham Division (D16) during April. Toton based 5281 spent the last days of October working local trips out of Thornaby, due to a shortage of suitable locomotives on Teeside. More transfers took place with 5281 - 5286 moving to Springs Branch during July. For some the stay here was not long, 5281 & 5282 moved to Toton during August, whilst 5283 followed in September. During the summer of 1973 5281 was noted on at least two Midland mainline services, during June it was noted on a Sheffield - St. Pancras service with 7616, whilst on September 22nd it worked the 15.00 Sheffield - St. Pancras. Photograph collection of Ian Hammond. 5281 at Springs Branch sometime in August 1973. 25131 worked the 8B40 Whitemoor - Hitchin (via Royston not ECML) on April 14th. On May 31st a roundtrip Leicester - Skegness was worked by 25131 & 25129. A week later on June 7th 25131 & 25129 were still together and worked the 07.35 Nottingham – Llandudno Town, the return working was handled by different locomotives. Coventry commenced its holiday weeks on July 12th, few extras were run though 25122 & 25131 took one to Norwich, being the 06.40 Coventry - Yarmouth, which was the extended 07.25 Birmingham - Norwich. On August 30th the 08.00 Walsall - Yarmouth to Norwich and the return 14.15 Yarmouth - Derby from Norwich were worked by 25131 & 25268. 25131 was noted at Derby Works during May. A Euston - Tywyn day excursion on May 29th was worked roundtrip Wolverhampton - Tywyn by 25131 & 25057. About a month later on June 26th the 08.00 Walsall - Yarmouth to Norwich and the return 14.15 Yarmouth - Derby from Norwich were worked by 25131 & 25145. July 1st saw 25131 work the 17.00 Derby - Matlock and the 17.50 Matlock - Derby, utilising a rake of nine Mk1 coaches. On July 24th the 08.00 Walsall - Yarmouth to Norwich and the return 14.15 Yarmouth - Derby from Norwich were worked by 25131 & 25120. A busy week started on August 28th with 25131 & 25120 working the 08.00 Walsall - Yarmouth to Norwich and the return 14.15 Yarmouth - Derby from Norwich. The following days saw the same pair work roundtrips to Skegness, from Derby (29th & 31st). A roundtrip Leicester - Skegness took place on September 4th with 25131 & 25279. 25131 rescued a failed Peak on September 7th working the 15.30 ex-St Pancras forward from Bedford to Nottingham. It was another trip across Cambrian metals on June 5th when 25131 & 25143 worked a Birmingham New Street - Barmouth special forward from Shrewsbury. 25143 had to be removed at Machynlleth after sustaining a broken fuel pipe. On the return working 25131 worked the lighter Barmouth - Stroud to Wolverhampton. The next day (6th) a roundtrip Lichfield City - Llandudno Town day excursion was worked by 25131 & 25111. On July 16th a roundtrip Leicester - Skegness was worked by 25131 & 25173, the return leg worked only as far as Nottingham. On August 21st the 08.45 Birmingham New Street - Barmouth from/to Shrewsbury was worked by 25131 & 25165. The afternoon Whitemoor - King's Lynn freight was worked by 25131 on November 10th. On May 20th the 'Thames - Forth Express' from St. Pancras to Edinburgh was worked to Leeds by 25131 & 25302, Class 55 No. 55012 worked the excursion forward. June 11th saw a number of extra locomotive hauled workings over the Cambrian route including 25131 & 25310 running throughout from Wellingborough to Aberystwyth with a mystery excursion. Class 31s were still first choice on the Birmingham - Norwich services, but Class 25’s frequently substituted, on August 19th 25131 handled the 10.15 to Norwich. On September 2nd the Derby - Norwich - Yarmouth - Norwich - Walsall diagram was worked by 25131 & 25130, on the return leg the locomotives were replaced at Peterborough by 31175. Visitors to Kings Lynn off the Whitemoor freight included 25131 on September 11th. 25131 had monumental railtour duty on September 16th working the AC/DC railtour six miles between Manchester Piccadilly & Stockport. Heavy snowfall and cold weather during the middle of February created many problems. 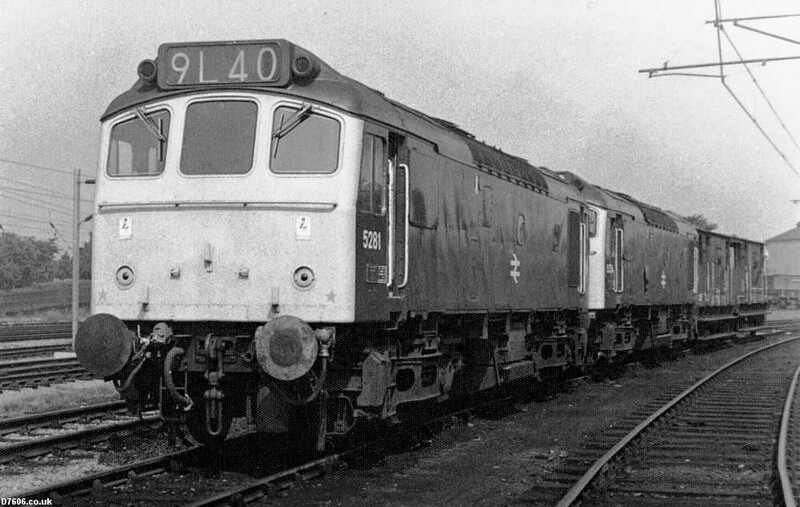 Matters were not helped by a Manchester area dispute affecting diesel multiple unit refueling leading to greater use of Type 4s (including 46020 & 46030) on the Blackpool – Manchester services. February 23rd found 25131 on the 08.10 Manchester Victoria - Southport, one of four passenger trips made this day. May 7th's Burton - Skegness round trip featured 25131 & 25142. On July 20th the 17.10 Poole - Nottingham was worked forward from Birmingham New Street (?) by 25131. A couple of days later 25131 & 25157 worked Leicester - Skegness roundtrips on July 23rd & 24th. On August 25th a special flyash working from the LMR was noted at Peterborough with 25131 & 25135. The same locomotives worked roundtrips to Skegness from Derby on August 26th and Leicester (27th, 29th & 30th). September 4th’s Southam trip proved a little strenuous for 25243 as it caught fire at the site of Marton station. 25131 & 25135 rescued the train several hours later. The afternoon sun light ups 25131 as it passes the north end of Derby station, no doubt headed for the fuelling point, November 24th 1979. 25131 was noted westbound through Chinley on May 21st with loaded short-wheelbase hoppers. 25131 & 25073 were stabled at Buxton on May 26th. On June 13th the 13.34 Birmingham New Street - York and the return 17.26 York - Birmingham New Street were worked by 25131 & 25260. On August 2nd the 07.35 Nottingham - Llandudno Town was worked to Derby by 25131. Four days later (4th) the 19.41 Leicester - St. Pancras was worked by 25131 & 45025. On August 23rd 25131 & 25133 worked the Derby - Norwich - Yarmouth - Norwich - Walsall diagram. A week later on August 30th 25131 & 25129 worked the 08.02 Walsall - Yarmouth to Norwich and the return 14.15 Yarmouth - Derby from Norwich. A roundtrip Leicester - Skegness was worked by 25131 & 25129 on September 1st, whilst on September 4th the same pair worked a Burton - Skegness roundtrip and on September 6th worked the Derby - Norwich - Yarmouth - Norwich - Walsall diagram. On May 28th 25131 worked the 19.30 Crewe - Cardiff. The 04.10 Shrewsbury - Aberystwyth and the 10.07 Aberystwyth - Euston to Wolverhampton were worked by 25131 & 25036 on August 22nd. Four days later (26th) 25131 worked the 13.15 Birmingham New Street - Norwich (throughout?). On September 19th the 07.40 Euston - Aberystwyth from Wolverhampton and the 16.05 Aberystwyth - Wolverhampton were worked by 25131 & 25124. A week later on a damp September 26th (27th?) a Bolton - Bewdley railtour was worked from/to Birmingham New Street by 25131 & 25139. During February 25131 was transferred to Cricklewood, this would be its last transfer. The 12.07 Holyhead - Crewe was worked by 25131 on May 8th. On June 19th the 09.22 Derby - Skegness was worked to Nottingham by 25131, where it was replaced by 20159 & 20173. The 08.24 Leicester - Skegness and 18.50 Skegness - Leicester were worked by 25131 & 25129 on September 2nd. A week later (9th) a diesel multiple unit failure saw 25131 work the 09.55 Llandudno Town - Blaenau Ffestiniog and the return 11.18 Blaenau Ffestiniog - Llandudno Town. On October 3rd 25131 was noted southbound at Darlington towing 46017 & 31301 and a couple of brake vans. On December 6th 25131 (& 25130) were withdrawn, 25131 was taken out of service at Toton. After withdrawal 25131 was renumbered 97202 for use by the C.M. & E.E. It was renumbered back to 25131 in January 1984 and then promptly withdrawn again. Photographer courtesy Tony Sayer. 25131 has been withdrawn for about seven months as it sits in the sun at Toton on July 30th 1983, with at least one buffer missing. After renumbering 'on paper' from 97202 to 25131 was withdrawn for a second time during January, presumably to allow TOPS to handle its movement for scrapping. During September 2017 a builder's plate from 25131 sold on ebay for GBP325.99. Page added October 10th 2001. Page updated February 24th 2019.